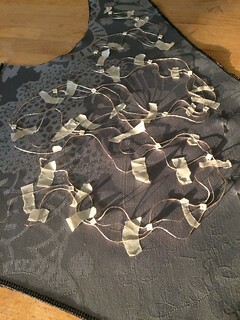 Over the summer we received this commission from Wim. 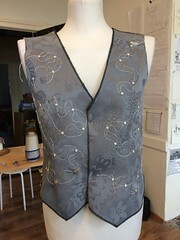 He read about our shop and this gave him the idea to commission a vest with special lighting effects for the stories he tells. 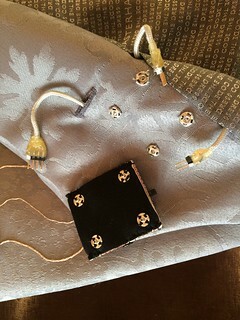 … and here is the outcome. 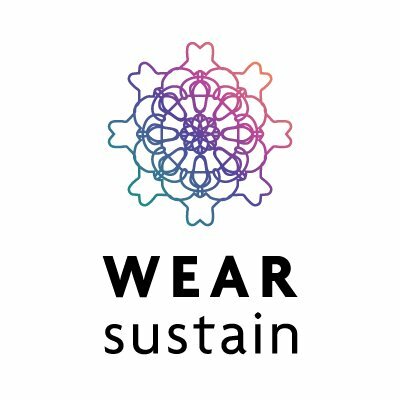 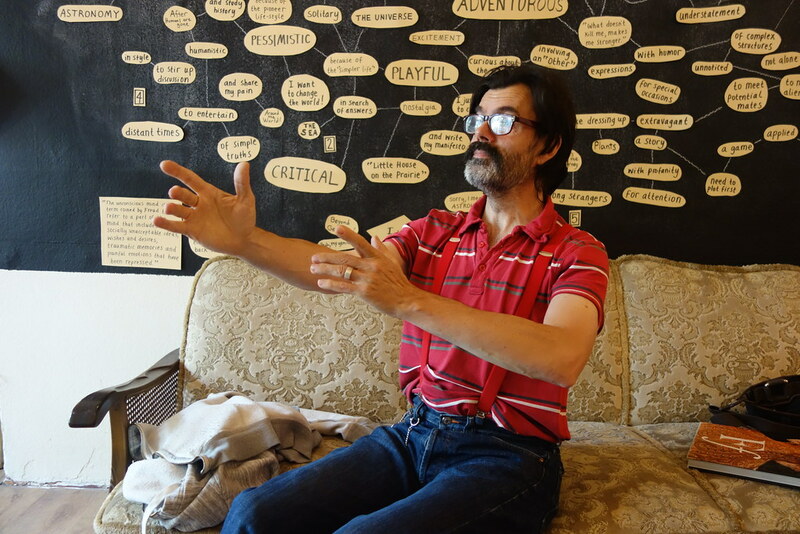 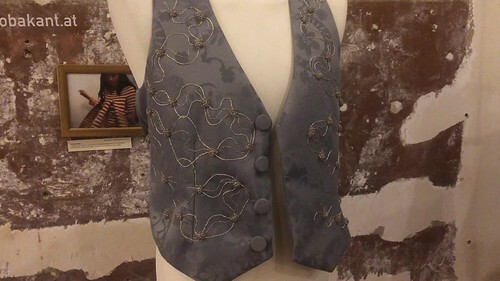 Wim telling the story of Whitemoon with the storytelling vest. 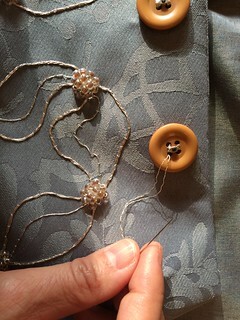 sewing of the button button on the jacket. 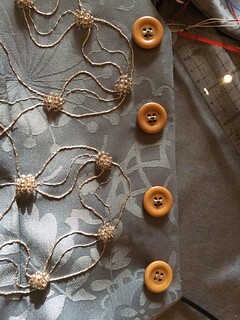 Each button connection is made with elitex silver thread. 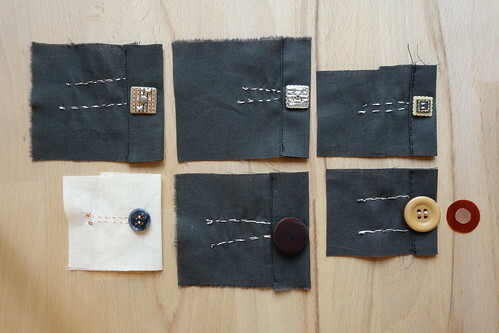 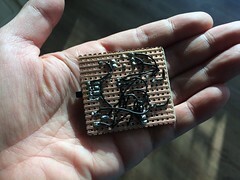 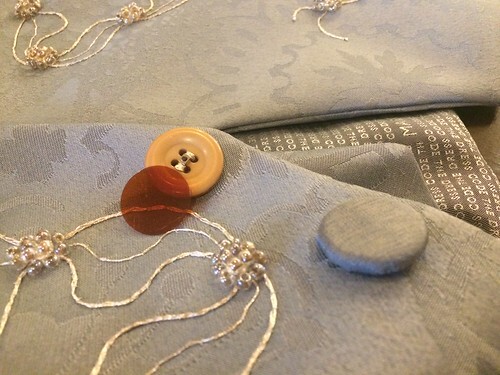 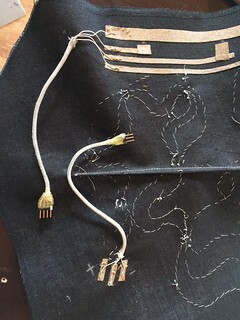 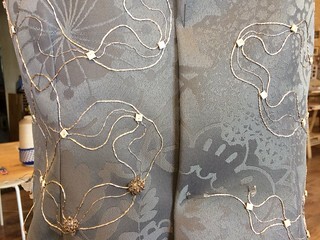 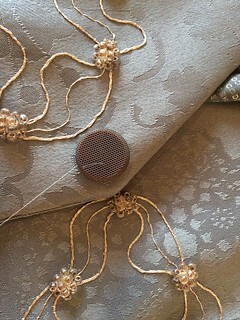 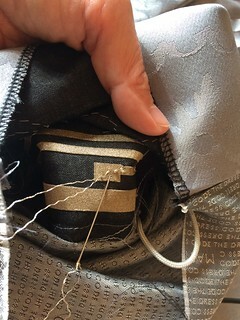 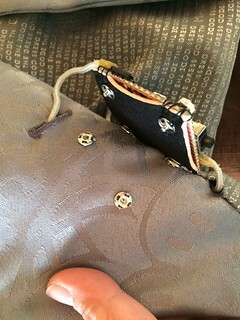 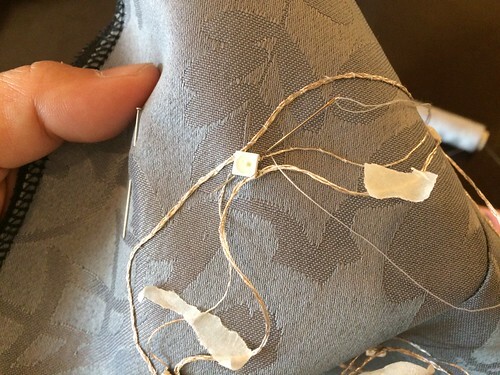 after two separate connection of the each button is sewn onto separate conductive fabric on the back with separate elitex threads, it is wrapped around with normal thread to protect the thread connection and prevent them to touch each other. 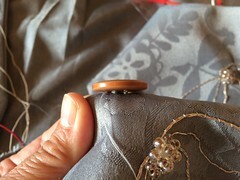 Then the button button is covered with plastic (kapton in this case) piece so you can press the whole button surface to press the “button”. 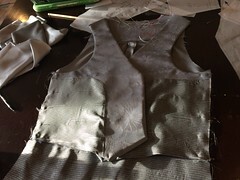 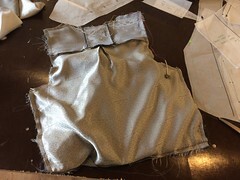 The whole button is covered first with stretchy fabric (power mesh) so the plastic stays in place, then covered with another layer of gray fabric to match the look to the base fabric of the waist coat. 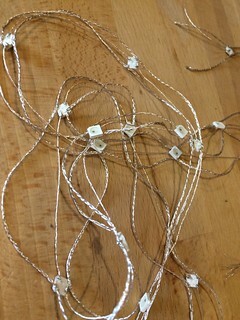 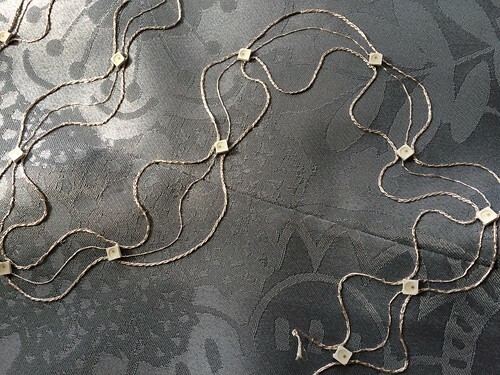 + and – connection is made with braided three strings of karl grimm silver thread. 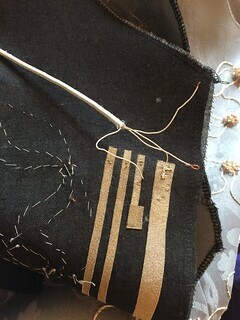 Data line is single line of karl grimm thread. 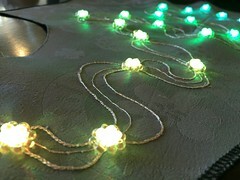 WS2812 5050 SMD LED is soldered directly onto the karl grimm thread. 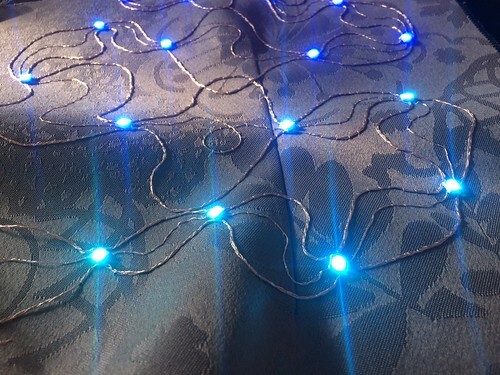 After mounting all the LED on the thread, it was fastened on the fabric using couching technique. 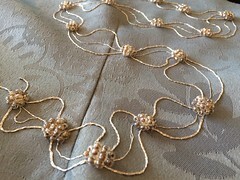 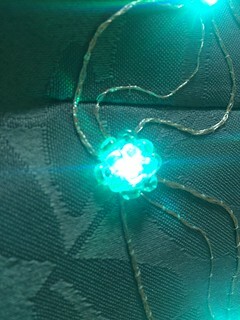 After the LED thread is placed on the fabric, glass bead was added on the LED to diffuse and also protect the solder connection. 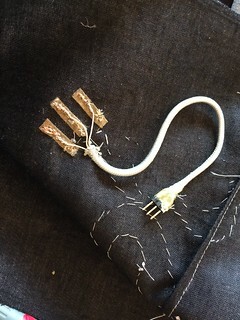 on the back of the LED connection point and button switch connection point, silver stretch fabric is fused to make the connection point. 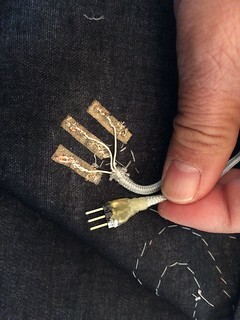 From these fabric to the circuit board connection is made with thin copper cable. 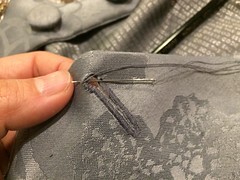 These cable is covered with parachute fabric cable, soldered to header. 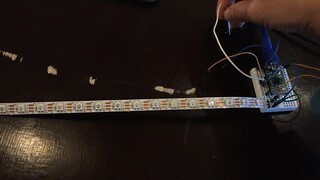 To prevent the header solder point from breaking, it is covered with hot glue. 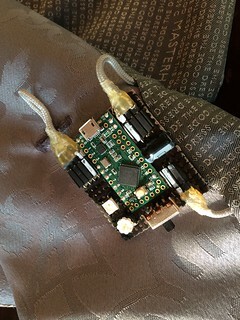 GND connection is marked as while on the header and socket. 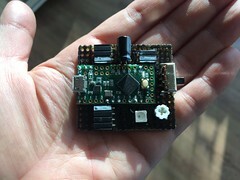 The board used in this project is called Teensy LC. 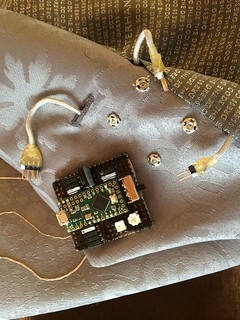 Install the Arduino on your computer first, then Teensy uploader following the installer instruction. 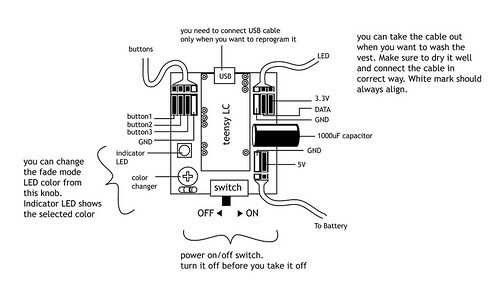 Once both is there, Open the Arduino, choose “Teensy LC) from “Tools>> Board” from the menu. 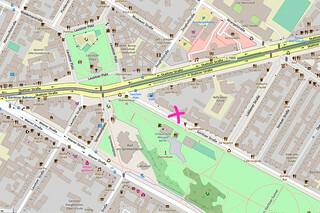 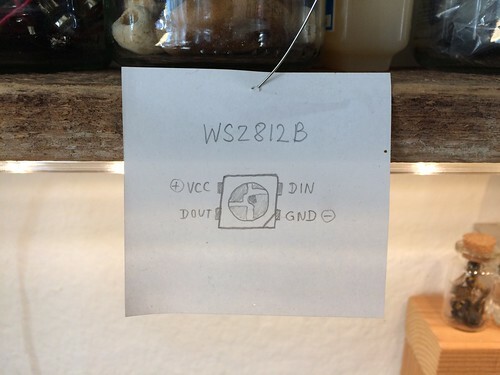 Download the sketch from the below github link, open it on Arduino and upload by clicking arrow button on left top corner of Arduino window. 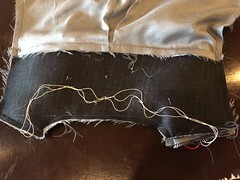 I followed the above tutorial to bag out the lining, and left out right side liner side seam open to pull the inside out. 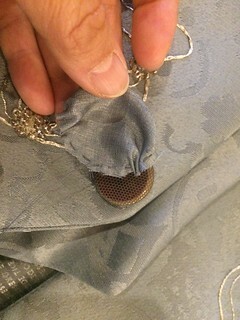 Then the button was added while this seam was open so I can see where the back side of the button is connected. 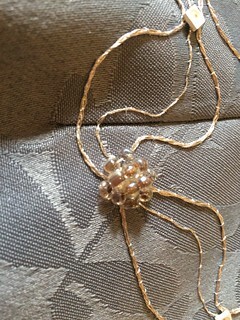 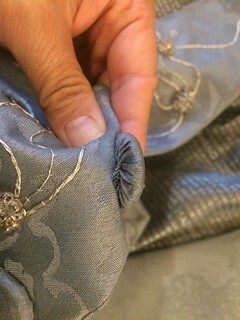 Then this side seam was closed by hand stitch. 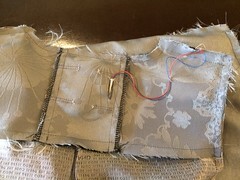 Lastly the button hole is made on the left side of the front panel. 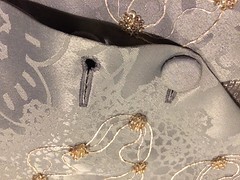 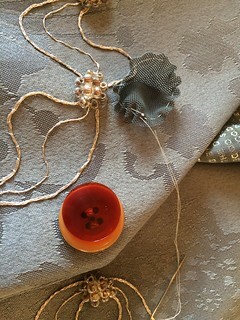 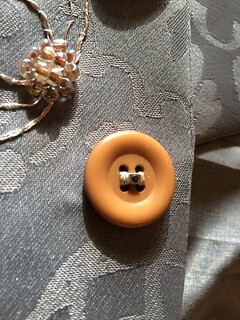 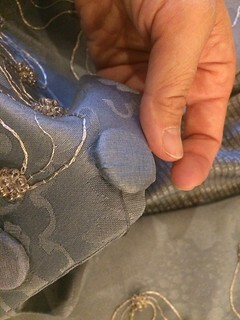 As the stem of the button is thick as it has two connection to the base fabric, we needed to make the button hole bigger. 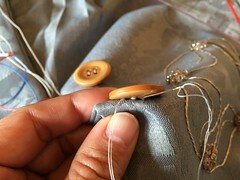 Instead of normal button hole, we made it as keyhole shape button hole, which is often used for jeans buttons.